Last weekend, a caravan of hockey players and orange-clad fans invaded the northern border with malicious intent. They were fully prepared to abscond with standings points if they were misappropriated by the Canadian clubs. The official report shows that they escaped the great white north with six standings points acquired over three days in three cities, and no fines paid despite leaving without any receipts. By all reports, everyone was able to return safely from the successful crusade. Aube-Kubel with the overtime winner and the post-game interview in French. What could be better? Solid start in net by Carter Hart. Again on this trip the Phantom spot the home team a couple goals before getting in the swing. Chris Conner is tripped with 13 seconds remaining, finishes a penalty shot, and Taylor Leier buries an empty-net tally to finish it. Alex Lyon between the pipes. Tyrell Goulbourne with an epic fight in this game, again switching to southpaw and with it a knockdown via overhand left. I’ll post video when I get a good copy of it. The Hamilton Street Heroes easily handle the defending champions in the finale of their Canadian mission. Carter Hart back in net for this one in what was described as his best outing to date. Another penalty shot goal this time by Taylor Leier. Phantoms went ahead and never looked back thanks to two first-period markers from the Carey to Varone connection. I went to the PCT rank standings due to the games in hand. Phantoms are third on straight points. Alex Lyon and Tyrell Goulbourne returned from Philadelphia. Krusher was along for the ride to Canada to make sure we had enough depth at forward; I don’t believe he played. Stolie remains with the Flyers, and appears to have the hot hand among the healthy NHL goalies right now, so we may not see him back. Pickard was waived and claimed by Arizona. 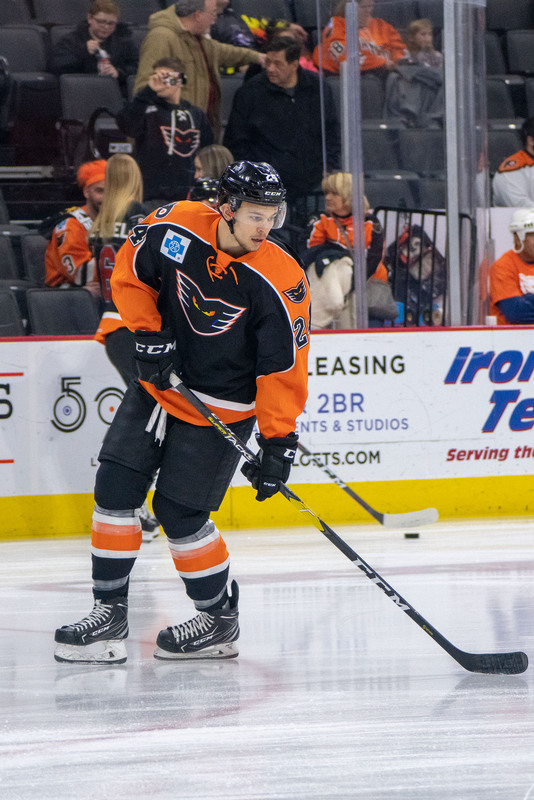 For the Phantoms, F German Rubstov remains out with injury and will not play again this season. This makes me sad. 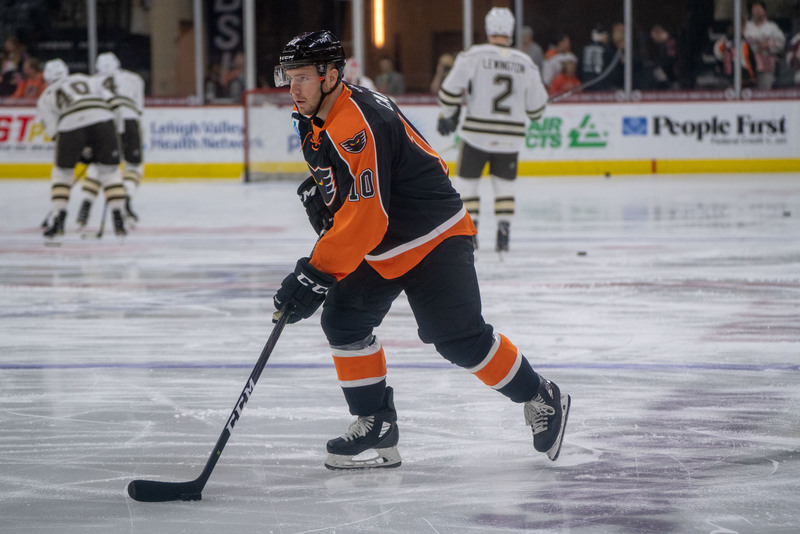 The Lehigh Valley Phantoms netted goals off of penalty shots in back-to-back games this past weekend: Chris Conner converted with 13 seconds remaining in the game on Saturday against the Senators while Taylor Leier found the back of the net on Sunday against the Marlies. 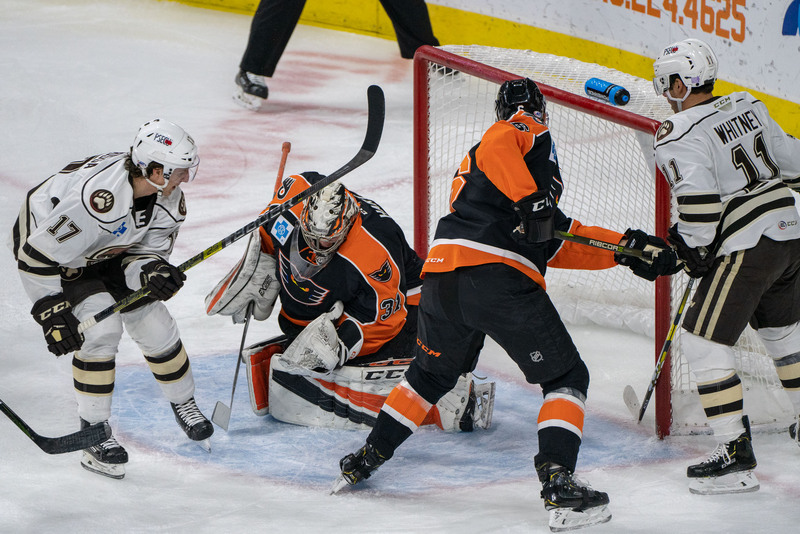 Those two markers are the fourth and fifth penalty shot goals in Lehigh Valley history and Conner’s marked his second as a Phantom. Lehigh Valley captain Colin McDonald will play in his 800th professional game on Wednesday night against the Cleveland Monsters. In his now 12-year career, the Wethersfield, Connecticut, native has amassed 178 goals and 215 assists for a combined 393 total points. The Phantoms have now gone five consecutive games without allowing a power-play goal, dating back to November 23 against the Hershey Bears. During that time, Lehigh Valley has gone 25 for 25. Earlier this season, between Oct. 28 and Nov. 16, the Phantoms were able to string together a similar seven-game streak in which they were 30 for 30. This past weekend’s three-in-three triumph north of the border marks only the second time in Phantoms franchise history that the team has managed to win three consecutive road games, in three different cities, in three nights. The only other time that feat has been accomplished was in 2005 when the Phantoms topped the Cincinnati Mighty Ducks, Milwaukee Admirals and Grand Rapids Griffins. That same team went on to win the Calder Cup later that season. Welcome the Cleveland Monsters! They’ll be making their first appearance at the PPL Center tonight. The AHL affiliate of the Columbus Blue Jackets is in third place in the AHL North, as they move out of the Central Division this season. I don’t recognize a lot of names on their roster, buy you’ll want to look out for Centerman #28 Zac Dalpe and rookie LW #19 Eric Robinson. On the blueline look out for #3 Tommy Cross and #2 Adam Clendening, who played with Scranton in 2015-16. The Monsters carry three goalies; #35 Jean-Francois Berube appears to be the main netminder sporting an .897 save percentage. He was with Bridgeport for a few games a couple years ago. Tonight is “light-up night” as we celebrate the Hanukkah holiday. It was on light-up night when we blitzed Binghamton for three goals in 21 seconds a few years ago. DiPro was at the bar getting a drink and when he returned we were up 3-0! As frequent readers know, I love the Wednesdays–I’ll be doing some “research” downtown tonight prior to the game and will have some reporting to due in advance of the weekend games this week. Always about the goalies. Carter got 2 of the 3 starts on the road this past weekend, and with three games this week at home–tonight and Friday and Saturday–I think he’ll be in net tonight with Lyon backing up. New Flyers GM Chuck Fletcher will be in the house tonight–and while I don’t think we’ll see him wandering around on the concourse, I’m sure he’ll like to get a look at the #1 prospect. That said, I’m thinking he’s not going to tell Coach Gordon what to do, either. Anyway, keep an eye out because if you do see Chuck, make sure to welcome him and show him what great hockey fans we have here in Allentown. Watch the special teams. The penalty kill is absolutely on fire, killing 55 of 56 over the past 13 games. The Power Play has risen to top 5 in the league as well. This is partly why we’ve been winning of late, and I look for it to continue as a sign of good coaching and excellent effort by the guys out on the ice. Watch for pump fakes. I think a couple of these refs tonight are quite guilty of that on face-offs. I’m ready to let them hear about it. Apologies in advance to Jeff and family sitting in front of me; I might get loud. Just drop the puck refs, and let’s play hockey–I’m not here to watch you hold the puck in your hand! That said, this could be an advantage as the visiting Monsters might not be familiar with this particular transgression, and we could get an advantage. Watch the lines. I did see a couple incarnations of our most recent lineups reported from the Canadian trip. Aube-Kubel on the top line is common, but I think Kaše is getting some time there, so watch out for that. Regardless, watch that top line. Carey and Varone are absolutely clicking right now and it’s fun to watch. This is the first of four in a row at home, with Hershey coming in Friday for “Pink in the Rink” and Cleveland returning on Saturday for a Teddy Bear Toss re-match. A week from Friday, look for Belleville to stop by on the 14th for Youth Winter Hat night. · Season Ticket Holder Gift: Stop by the retention table located at the top of the Air Products entrance to pick up your Colin McDonald bobble head at any game during the month of December. To redeem your gift, please hand in your bobble head voucher located in the back of your ticket booklet. · Holiday Packs on Sale: Receive 4 tickets to a select game and an Alex Lyon bobble head! If interested, please feel free to contact me to go over available dates and pricing. · Teddy Bear Toss: Our annual Teddy Bear Toss game is this Saturday, December 8th at 7:05pm. We encourage you to bring new or gently-used stuffed animals to throw on the ice after the Phantoms score their first goal! All of the stuffed animals will then be counted and donated to Valley Youth House for distribution to children across the Lehigh Valley. Help us set a new franchise record and give back to a great cause! · Group Outing Opportunities: Whether you are looking for a fun night out with family and friends, entertaining clients, or rewarding employees; we have a variety of areas we offer for different groups. Interested in learning more? Please contact me directly at 484-273-4547.